P4C (philosophy for children) is a way of learning that encourages children to raise questions and think deeply. It helps children to communicate effectively and to think independently. 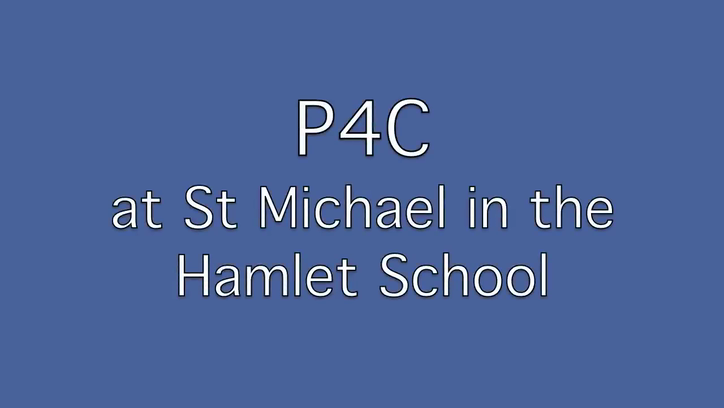 The teachers at St Michael in the Hamlet use P4C in all areas of the curriculum and we have seen brilliant results since we first started using it in 2013. We were recently awarded the Silver P4C award and are aiming to get gold next couple of years. We are only the second school in Liverpool to receive this prestigious award. You can read a copy of each report in the section below. Please have a look at these P4C questions, in the link below, which you can discuss with the whole family. What do our children think of P4C? P4C is a fun way to tell each other our opinions. It helps me to break out of my cage and say my opinions. You can find out things about your friends you never knew before. It’s interesting to hear about what other people think. P4C is a great way to express yourself! I change my mind a lot when I hear people express other opinions. I think P4C is good because we learn about other people’s choices. It’s great to hear what everyone else thinks, not just what I think!